Here’s a bit of unfinished business. I’ve been meaning to point you to this FREE MP3 for nearly two years. Just kept slipping my mind. 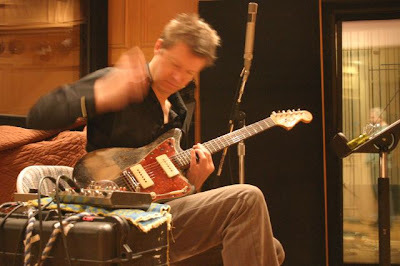 Nels Cline is a gifted and versatile guitarist who plays the jazz, plays the rock, and plays the experimental music. “Caved-In Heart Blues” has the slowest tempo of any tune I’ve ever heard... or it feels like that anyway. With a lot of open space. I think there’s something magical about it all. Click here to hear “Caved-In Heart Blues” on my Vox blog. To download it, click the song title below. He also plays with Wilco and helped tear up a great set at Jazz Fest last weekend. Ahh, Jazz Fest. One of these years I'll make it. I've never heard Wilco's music. @ UBM - Dang, you left right before it started! You definitely need to check it out; between the food and the music choices, there's nothing like it. Wlico may not be in your musical wheelhouse, but they are a talented outfit and worth checking out.